Nasha was born 28 years ago in Lampang a province in the North of Thailand, she came to Bangkok already at the age of one year, so calling her a real Bangkokian is not an exaggeration. Nasha Mekraksavanich is a bag designer. The first time I met her, her incredible and uncommon beauty struck me, this was not a woman who follows a trend, she makes her own! she has great style, very classic and yet edgy the way she dresses, her hair is a boyish “Jeanne D’Arc” (Joan of Arc) cut, which gives her a slightly androgynous look and at the same time brings out her femininity way better than laces, frou-frou and mini-skirts. Writing this article was something I wanted immediately the first time I met Nasha,the conversation was just so easy with her… It took us some time to set up a meeting for this interview, she is rarely in Bangkok during a normal work week and she’s also been travelling quite a lot. But finally we found a perfect moment, with coffee, at one of my favourite places in Ekkamai and we had a long talk that lovely afternoon. to grow an interest in design and after finishing school she went to study Interior Design & Architecture at Silpakorn University in Bangkok. She received a Bachelor’s Degree and then started to work in the field of Interior Design, but not for very long. I realised quite early that it wasn’t exactly what I wanted, so I sent a portfolio to the” Istituto Marangoni” in Milan and got accepted and started studying “Shoe Pattern Making” a course for 2 years and received my Diploma. She also added a Master’s Degree to her CV in Accessories Design as well. I worked for some time after my graduation in Milan, for a young company as the head of accessories design, but felt in some way that Bangkok was calling me back. Now we have to mention that Nasha received a prestigious scholarship from the Richmond Group and could have made a career working for numerous and well established brands, but she most strongly desired to start something on her own, create something from the beginning and to be able to explore form and materials and to deepen the understanding of a handmade production from the first step until the very last. Up until today, she started her company in 2011, she has produced 3 collections and the 4th is under production, which will be out by September 2014. She has shown her collections since the beginning in Paris, during fashion week, and from this year she has shown her Autumn/Winter collection in Japan as well. I work out of my studio & factory in Nakhon Pathom, outside of Bangkok, together with 3 technicians. They are specialised craftsmen who work with rather difficult technic to be able to produce “Haute Couture” bags. She has an extraordinary sense of materials, she works mostly with goat leather imported from the South of France, but sometimes also very unusual materials like stingray, which you find a lot of in the Oceans around Thailand, it is an extremely difficult process and which demands a very skillful staff, including Nasha. I live in Nakhon Pathom during my work week and go back to Bangkok for short weekends! Each collection demands an enormous work from quite a small staff, the bags are sent to about 25 department stores and boutiques around the world. 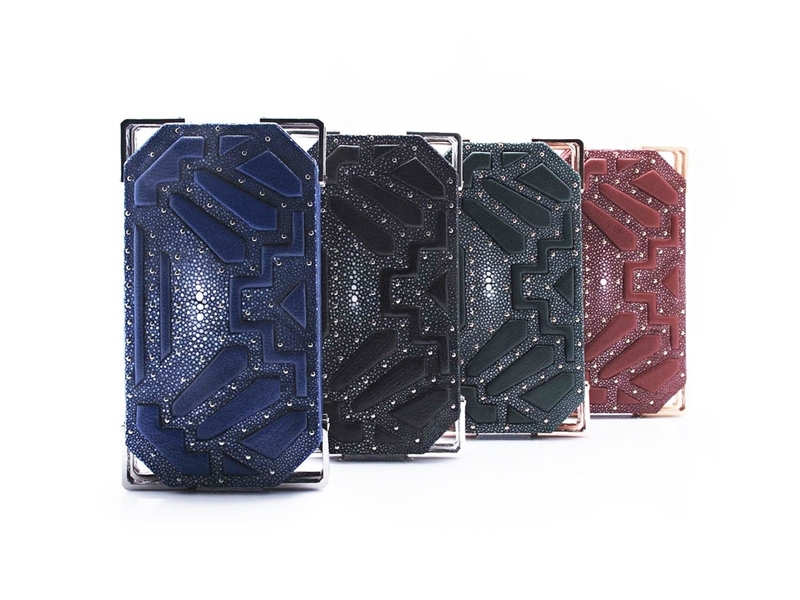 She has had a tremendous breakthrough into the European, Middle East and US markets, with resellers in New York (FIVESTORY), London (Selfridges), Paris (new boutique called, LES SUITES), Florence, (Luisa Via Roma) and Dubai, (Mahani) and many more…. She has of course a market here in Thailand as well, CLUB 21 in Siam Paragon and Erawan department stores. When it comes to the Asian market, which actually sounds quite paradoxal, usually the Asian market in these days, picks up on new businesses much quicker than European or US markets, but in the case for Nasha Mekraksavanich, she feels that the Asian market is a little slower in interaction with her brand, more hesitant and perhaps still has an issue with price range. Her product is definitely a high-end product and just to mention the bag Etienne Exotique/Stingray, this exquisite piece of surreal art! well the art justifies the price ! The clutch Etienne Exotique/ Stingray from Nasha Mekraksavanich autumn/winter collection 2013. Her way of designing is remarkably “architectural” in the sense of that she draws her collection with AutoCad program, which is the very essence of instrument for architects when they lay the design. You get a feeling of shapes, dimensions and layout immediately. It is an excellent tool and obviously it becomes easy to maneuver for someone like Nasha, who already has a background in interior design and architecture and who has extensively worked with it for a long time . Her first collection had 7 bags and now she has 10. They are Etienne, Theo, Russel, Ettore, Eileen, Javier, Marl, Alix, Simona and Viola. Nasha sees her future in expanding her brand on the Asian market, perhaps even a launch of shoes…. she did start out with “shoe pattern making”…… but this is nothing planned for the near future, but it could be very much an exciting and possible project for her…? And for the bags….. I guess we will most certainly see new models, I personally think that the clutch Etienne has already become a classic! Even if he isn’t that old…..
Nasha Mekraksavanich, The Bag Theo.